Thanks for the sidecar hangout. Re: Thanks for the sidecar hangout. Cool! For some reason I feel obligated to post a picture of my K with a Flexit, the leaning-sliding-canopy car I had many years and colors schemes ago. Note the tree in the front yard. Couldn't stand not having a solo bike so it had to go and much later a Ural appeared. Makes a good pair. Chaos......You The Man! That's the spirit a lotta K, a little SC! Think how wonderful a Ural with a K-motor would be. Why that's a great crowd funding project.............we could probably sell thousands and have a Telsa-like waiting list! Who wants to subscribe? 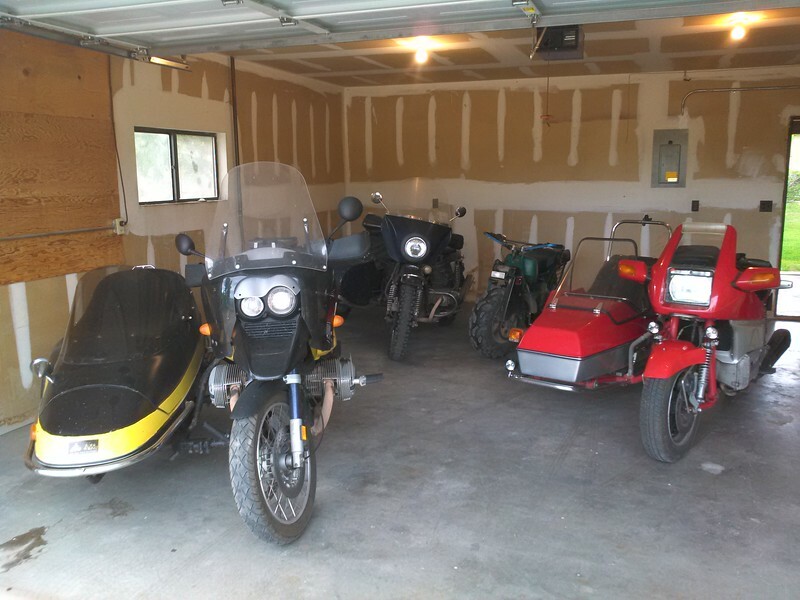 Part of my collection, the little one is a Rokon, still have not found a good deal on the factory sidecar for it but I keep looking. Just got a message from a friend that has a K1100 rig and he is in Yellowknife as of yesterday and getting ready to head up the Dempster to Inuvik. Her are the only pictures of his rig that I could find real quick. He also tows a small popup camping trailer behind it. I will dig up some more pictures when I get to work Monday and have some bandwidth to work with but for now if you are bored here are a few pictures from the last few sidecar nationals. And the Griffith Park get together. That's what we need! Thanks for putting that together. I recognize the EML , what makes are the friend and yours? How's the heat output on that LT? Well then, Spence, Old Boy, rally the K-rigs to step out of the shadows. We seem to be at a cross-roads: many folks seem to be attracted to transition from two-wheelers to trikes........less "control anxiety", so they get a monster motorcycle, add a monster sidecar, and ride in parades. 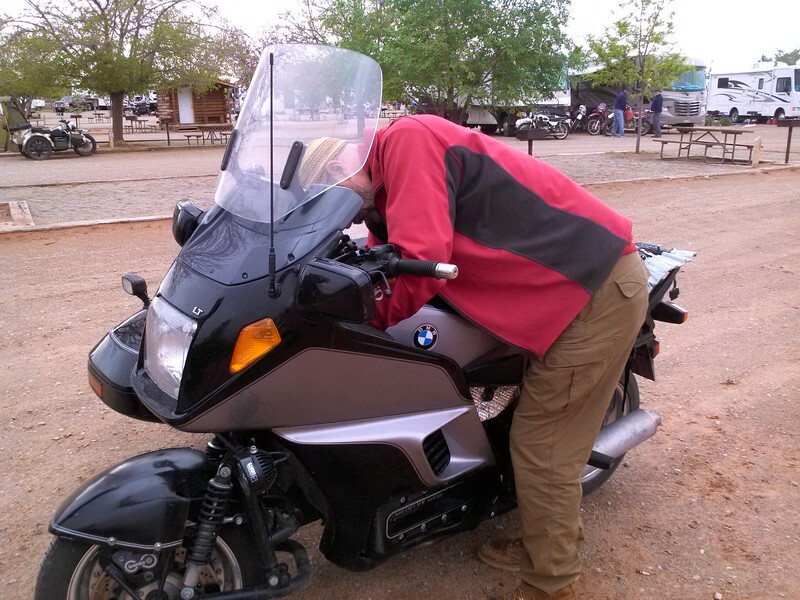 But dedicated motorcyclists who understand the history of sidecars, have selected the best bike for touring, BMW K-Bikes, and developed sidecar rigs! 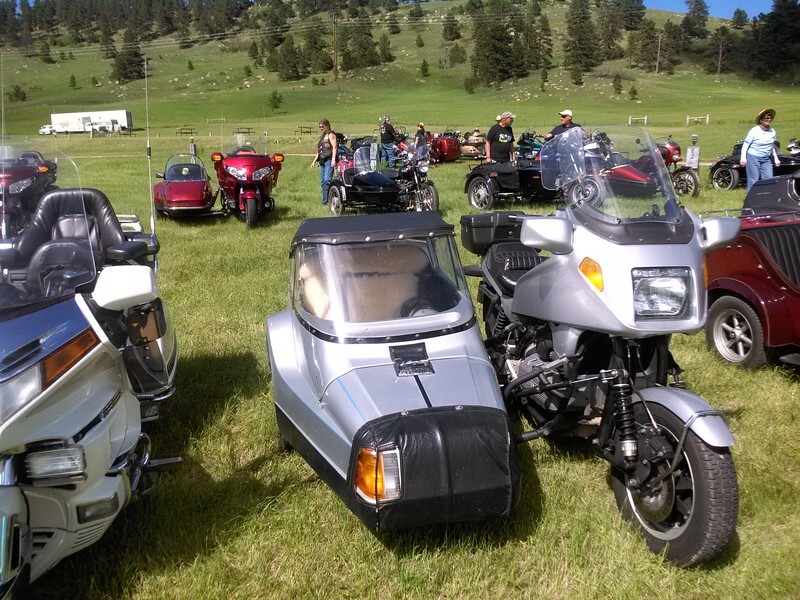 We can save mankind from the horrible curse of three wheel trike motorcycle conversions, by lighting the lamp of true motorcycle BMW K-side cars! Send your K-Rig pics to this site now! My hats off to DirtyDR, an oilhead, airhead (Urals count as airheads) and K all hacked! How to decide which one to ride and wish I had that problem. Agreed TrueAce something needs to be done about the rise of trikes, horrid contraptions most of us grow out of by age 3. Why HD never updated their SC from it's 1920's design and dumped it for a trike is beyond me, but then most things about that crowd escape me.
. . . the little one is a Rokon, still have not found a good deal on the factory sidecar for it but I keep looking. I just came across this tonight. I saw that one but too far to drive and I do not need a two stroke bike. I will come across one eventually but I am really in no hurry because it would just be a camp rig, the sidecars on the Rokons are no good off road. Here is one from last year's sidecar national in South Dakota, I was too busy hosting this years to get any pictures. 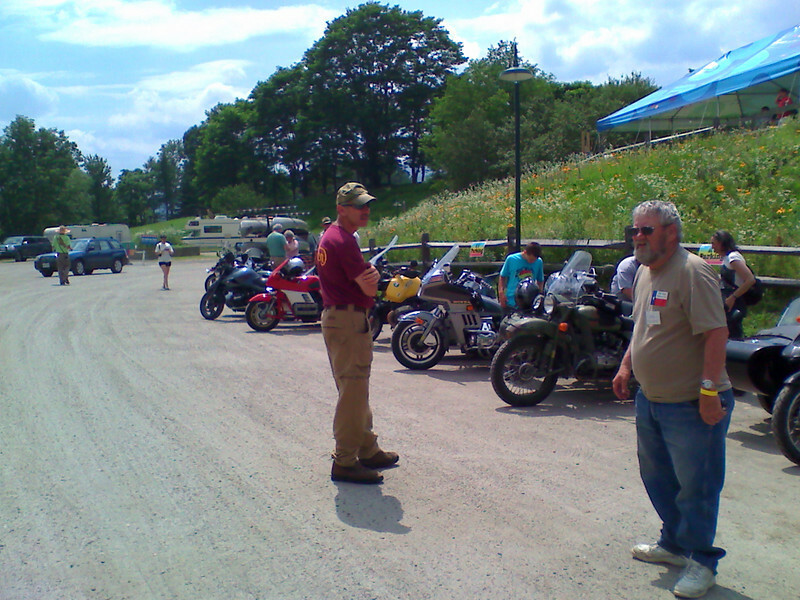 How about a picture of my yellow GS rig parked next to the red K100/EML rig in Ben & Jerry's parking lot in Vermont 7 years before I owned the K bike. And the other body I put on the GS when I am riding in Alaska, Canada, Mexico and such. This is outside of Skagway. DirtyDR , you might know this guy since you hosted the sidecar national. Old riding bud of mine, saw him this Sat just getting back from Colorado. I just recently got into the sidecar scene. I am still setting it up. I have joined the USCA. Mine is not a BMW setup. This is still new to me but I am learning quite a bit in a hurry. I am into it much more than I would be a trike. No friends with sidecars so I am so far just playing it by ear. That's cool. Tell us what you got and what you got planned. '05 Electra Glide with factory sidecar. About 90% complete. Should have it finished soon. Send pics as it is now and as you finish it! You may be the only HD sidecar on MOTOBRICK! 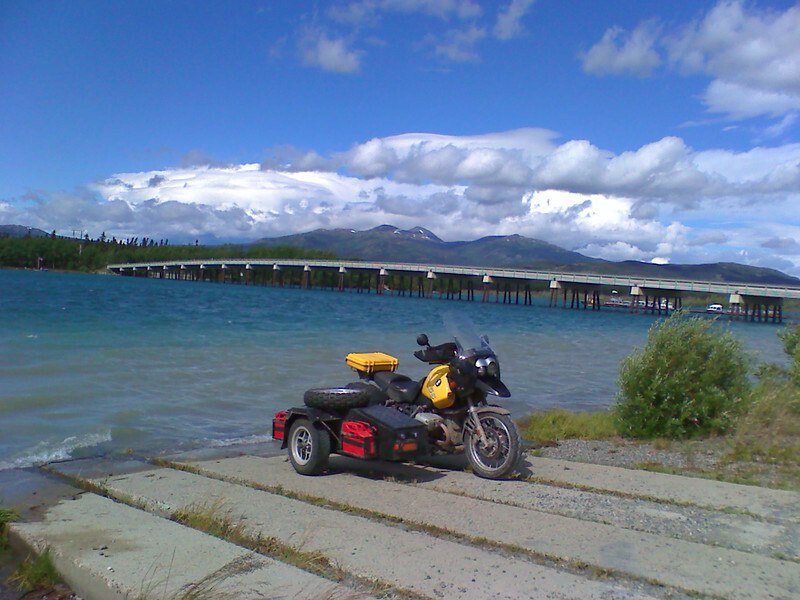 My friend, Joe, just sent me a picture from the Fort Simpson ferry in Alaska, still heading up to Inuvik. I have heard the ferry passages can be rough seas sometimes. Is he planning to ride back? Ask him to send us some posts. Wrong ferry, this one just crosses the Liard river in Fort Simpson. 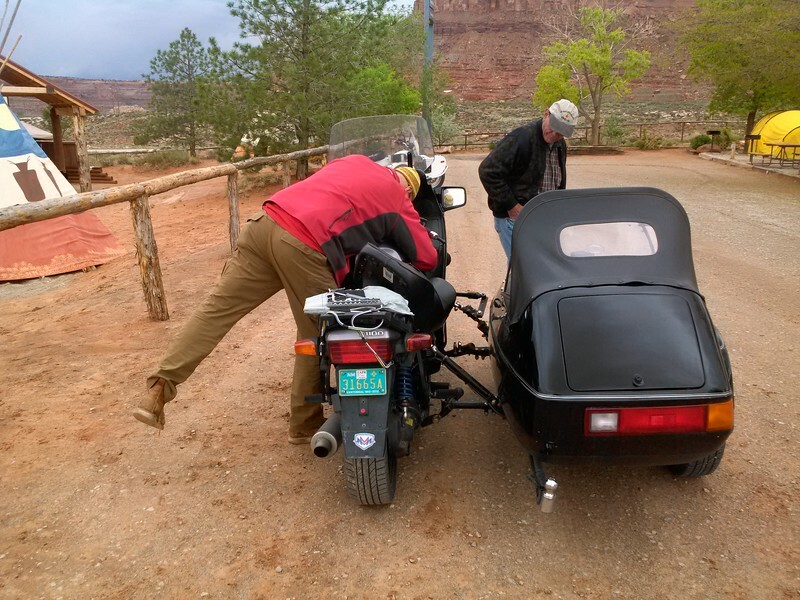 He rode up from the sidecar national and will ride back home to New Mexico. I will see what he has for pictures when he gets back but for now he just sends me a text every now and then.